Antiques quiz show hosted by Fern Britton. Antiques expert Paul Laidlaw assists Fern as the three teams compete for the prize. Browse content similar to Episode 9. Check below for episodes and series from the same categories and more! And the aim of the game is to amass the most valuable collection. is our very own resident expert. Would you please welcome Paul Laidlaw! Paul, lovely to have you here. -I like that very much. -That's very kind of you. -Spiffing's a first, but I'll take it. Yes, probably curiously English rather than Scottish word, spiffing. Now, tell me about the lots we've got here today. and a chest of drawers. than a tenner or less. That, of course, is the lot to avoid. So, who's playing today? Let's meet the teams. Team One, who are you? I'm Phyllis and this is my granddaughter Chloe. My nanna likes oil lamps and I'm a quizzing nerd. Very good, welcome to the show. Team Two, who are you? Hi, I'm Andy and this is my partner, Mark. And we're from Birmingham and we like to collect lustreware. And Team Three, who are you? I'm Linda and this is my husband, Bob. watched over by Paul, our expert. But could they separate the rust from the gold dust? Well, it's definitely quite a few hallmarks, isn't it? It is a London hallmark, I think. I think. This is the book, Tom Sawyer Abroad. The pages look very old, don't they, the edges? Do you think that's a first edition? -Well, that's English, though, isn't it? -So, surely it'll be an American publisher, wouldn't it? It looks pretty genuine and old, I think. Is it worth anything, though? Come on. Is it a fire screen, do you think? It obviously opens up and you can't work out why. It's in good condition, isn't it? So, you probably would pay quite a bit for it, I would have thought. It's very ornate, Victorian maybe. The hands are incredibly delicate. I don't think I've seen hands like that before. -What do you think of that? -Ah. Lalique. That's a name, isn't it? I don't know, these look a bit...a little bit tacky, don't they? -19th-century designer turning in grave. What about the eyes, are those rubies? I quite like those cups. The fact they're cracked, I think...probably a good sign. I don't like those at all. You watch, they'll be worth a fortune. What do you think about those decanters? Wouldn't have thought that would be worth...worth much. I mean, it is very ornate. Yeah, but they make hundreds of them, don't they? just mainly because the back looks so badly made. Why are you obsessed with the back? -Well, it's old, what do you expect? I know. Well, that's a good sign, isn't it? Whiffy's a good sign, that's a first. The top lot is the vase. You're having the Lalique. End of. And the bottom lot is the decanter labels. So, I'm going to go for the chest of drawers. -Right, let's go on and discuss strategy. So, when you were watching them, were any of them any good? I think some were pretty warm, if we're playing that game. Many were pretty cool, however. Now, tell me how you arrive at the valuation of these things. auction, but with no auction costs added. but that is for our winners to decide later. But for now, it is time for Round 1. I'm going to ask eight general knowledge questions. I'll ask you to select which lot you would like to play for. buzz in incorrectly and you'll be frozen out of the next question. So, pickers, please would you make your first pick? Let's see what you have all chosen. So, Chloe and Phyllis, you want the table. Andy and Mark, the book. And, Bob and Linda, you want the vase. Quizzers, fingers on buzzers, here comes question one. what is the name of the world's second largest street festival? Correct. The table is yours. The Rio Carnival, of course, is the biggest in the world. Chloe and Phyllis, you want the book this time. Andy and Mark want the vase, but so do Bob and Linda. Two teams after one lot, let's see what happens with question two. every 75 to 76 years? It is Halley's Comet, yes. Bob, the vase is yours. Oh, Andy and Mark, you missed that one. Never mind, here we go. Bob and Linda want the watch. Quizzers, fingers on buzzers, question three. In a popular nursery rhyme, which insect is told to fly away home? -Correct, it is a ladybird, and the screen is yours. you really want that book. Bob and Linda - the watch. The singer Shakira was born in which South American country? The chest of drawers are yours. Well done. Pickers, make a pick. Bob and Linda really want that watch. This is the third time they've picked it. on the logo of the charity WWF? But, yes, that is correct, and the cups are yours. Andy and Mark want that figure and Bob and Linda want the watch still. It's a battle now between Team One and Team Three. Question six, quizzers, fingers on buzzers. which part of the famous London landmark? And it is the main big bell. So, Chloe, the watch is yours. Bob and Linda, that was snatched from you. and Bob and Linda want the book. at the Boston law firm Cage and Fish? It was Ally McBeal, congratulations. You're doing very well, Chloe and Phyllis, very well indeed. Come along, Andy and Bob. Come on. Pickers, make a pick. Bob and Linda still want the book. This is the final question in this round. What is the astrological sign of someone born on April Fools' Day? Shame. Let's have a look at your collections at the end of Round 1.
the watch and the cellars. and Bob and Linda have the vase. but have they chosen wisely? Paul is going to give each pair a fact about a lot of their choice. Chloe and Phyllis. First of all, let's find out a bit more about you. What do you do, Chloe? I'm a criminal lawyer in Hampshire. "OK, you can call a lawyer," and you're the duty lawyer? Yeah, two in the morning, out I go. And I understand you love a quiz? -Yes, I am a bit, yeah. Well, it's starting to look that way, I must say. And sitting next to you is Phyllis. -Who bossed you into doing this, Phyllis? -Did she ask you or did she say...? -No, she said, "You're doing it." The chest of drawers, please. is renowned for its quality of material, design and construction. It's veneered in mahogany with brass handles. this has taken a bit of a downturn in recent years. or is it a case of back to the drawer-ing board? FERN LAUGHS OK, that's something for you to think about, Phyllis and Chloe. Andy and Mark, how long have you two been together? 30 years? You don't look old enough. Tell me about the Playgirls. Many years ago, we became semi-professional drag artists. Mark used to do impersonations of Shirley Bassey and Diana Ross. used to do Cher and Barbra Streisand. that you'd like to know more about? Yes, I'd like to know more about the book. otherwise known as Mark Twain. character - Tom Sawyer, friend of Huck Finn. a little fading perhaps, but it's in pretty good condition. Now, you could buy such a copy in a local bookshop for under £10. However, this is a British first edition, published in 1894.
the author and the subject make it an extremely interesting lot. OK, while you think about that, let's meet Bob and Linda. So, Bob, did you spend most of your working life in universities? and subsequently ended up in teaching for 36 years. And what was your subject? Lovely. Linda, how did you both meet? We met at a country club in Cheshire. "Would you like to come to see the Villa on Saturday?" -And I said, "No thank you." -He invited you to the football?! the football gaff, but that's fine. OK, which lot would you like to know more about? I think I'd like to know about the screen, please. -What we have here is a 19th-century fire screen. they would've been a very popular household accessory. style typical of the Aesthetic Movement. So, I hope that has helped, teams, cos it's now time to play Round 2.
and the quizzers will again try and secure it by answering correctly. question categories, and here they are. Ancient Egypt or US Politics. OK? Chloe and Phyllis, you're up first. Phyllis, what would you like to pick from the board? The Olympics or US Politics, Chloe? Which city has been chosen to host the 2020 Summer Olympics? Tokyo. The figure stays on the board. Andy and Mark. Mark, what would you like? The Olympics or US Politics, Andy? -I'll go for US Politics, I think, Fern, please. as the Grand Old Party? Um, I'll go for the Democrats. Oh, it's the other one - the Republican Party. OK, the figure's desperately...going to stay on the board. Linda, what would you like? I'd like the book, please. The book. Ancient Egypt or Italian Food, Bob? Poor Linda, she's bursting with it. Pharaohs is correct. The book is yours. Well, deserved, there you go. Right, we're going to have another pass at this. really want in your collection? Because if so, here's a chance to get your hands on it. or you can try to steal a lot that's in a rival team's collection. So, Andy and Mark, you are safe at the moment. So, Chloe and Phyllis, would you like to pick or steal for this? You're determined to get it. You're sticking there like a limpet. -I'll try again at the Olympics. In which country were the first modern Olympics hosted in 1896? It is Greece, congratulations, the figure is yours. -Oh, what do you want? -The vase, from Bob and Linda. What substance in leaves allows plants to absorb light energy? I'm sorry, you said chlorophilm and it's actually chlorophyll. -The vase stays with Bob and Linda. Linda, would you want to pick or steal? -I'd like to steal the watch, please. Chloe and Phyllis, what category would you like to give Bob? the character portrayed on screen by Sylvester Stallone? So, the watch stays with you, Chloe, for this, well done. Phyllis, would you like to pick or steal? -Steal. What do you want to steal? Bob and Linda, what are you going to give Chloe? Athlete Usain Bolt competes for which country? Jamaica it is, the vase is yours. There we go. Mark, pick or steal? OK. Chloe and Phyllis, you choose a category now for Andy. by the composer Sir Charles Parry? I have to pass, Fern, sorry. -I know, annoying, isn't it? Well, the vase stays with you, Chloe and Phyllis. -Will it be the vase? Yes. pick a subject for Bob. I think Action Films again. Sorry, Bob. You've found his weak spot. Drew Barrymore and which other actress? Yes. Lucy Liu it is, correct! The vase comes back to you. Sorry about that, Chloe and Phyllis. so let's see how the collections are looking. the cups, the watch and the cellars. Andy and Mark have the screen. OK, for one team, this is now, sadly, the end of the road. So, Paul, who is leaving us first? Andy and Mark, I'm so sorry. But you want to know what that screen's worth, don't you? -Yes, you do. So, tell us about it. Well, this screen had most of you perplexed during the viewing. giving one a writing surface. that is hugely valuable and you've all made a mistake. Well, no. It's redundant in today's home, it's only worth £60. Andy and Mark, thank you so much for playing For What It's Worth! and if the top lot is still in the game. These are a pair of brass candlesticks. in which the candle would sit. I think you were extremely dismissive of them. Not bad, though, for a pair of brass candlesticks. Next, you said bye to the paperweight. It's a large Baccarat example from the mid-19th century. one of Europe's leading names in glassware. Lastly, you were saying goodbye to our decanter labels. At first, they might look rather uninspiring. bearing the initials EL. Now, EL is the smith Edward Livingstone. Livingstone's a rather sought-after Scottish craftsman. but so is the least valuable. Teams, congratulations on getting this far. You now have one last chance to pick our expert's brains. Which lot do you really need to know more about? Team One, Phyllis, what would you like to know about? is known as a tripod table by virtue of its three legs. It dates back to the 19th century and is of Anglo-Indian origin. to craft these beautiful pieces. for the colonial British market and the wealthy locals. decorative figure than, say, rosewood. This style of furniture also may not be to everyone's taste. So, this could affect the commercial value. But what's its value to you? Bob and Linda, what would you like to know more about? mounted with silver and dating to the late 17th century. who was the fourth emperor of the Qing dynasty. but this piece is period. but it is solid with interesting geometric decoration. Would that make it more desirable, more unusual, more expensive? Well, that's for you to decide. It's now time for our final round. And at the end of it, we'll have our winners. In this round, I'm going to show you a category and 12 possible answers. Now, nine of the answers are correct, three are not. both quizzers and pickers will play. a lot from your collection. second. Paul, who is that? You go first with this question, and it is this. Celebrities Who Have Appeared In Absolutely Fabulous. Would you like to go first or second on this question? Let's go second. Second, please. Bob and Linda, here are the answers. Bob, give me an answer. If this goes green, it's correct. Joanna Lumley plays Patsy Stone. Yes, she plays two characters - Beth De Woodi and Candy. Yes, her character was Bettina. Well done. Oh. David Tennant is incorrect. Let's have a look at the other wrong answers. Ian McKellen was never in it and neither was Jack Dee. Chloe and Phyllis, prepare to steal from Bob and Linda. Do you want the book or the vase? Bob and Linda, that hurt, didn't it? OK. This is your question, Bob and Linda. known as Oceania, which is centred on Australia. -Would you like to go first or second? First? Here are the answers. Yes. North and South Islands, exactly right. Chloe. in the South Pacific. Linda. Correct. The Polynesian kingdom of more than 170 islands. Yes. More than 300 islands, apparently. Correct. There are six islands to Samoa. Yes, that's a chain of volcanic islands. Linda. Correct. About 80 islands there. Only two are now correct and three are wrong. Serrano is actually a ham or a chilli pepper. Let's see the other wrong answers. Chopine is a 16th-century platform shoe. Moana is the Hawaiian word for ocean. If you make a strategic pick here, who knows what could happen? -Go for the mugs, go for the mugs. -I'm not going to go for the mugs. The mugs might be the most expensive. Bob wanted the cups, you want the watch, and the watch it is. It's coming over to you right now. comics after originally appearing in another work of fiction. Chloe and Phyllis, would you like to go first or second? -First. Let's have a look at the answers. Chloe, give me an answer. Yes, first appeared in 1963. Yes. The famous DC Comic superhero. Phyllis. Yes, the enemy of Batman. Linda. Correct. He first appeared in 1941 in a comic. Correct. 1940 he first appeared. That was the only one I knew. so he really should be in a comic book, but he's real. and Katniss Everdeen is from The Hunger Games. So, Bob and Linda, what are you going to have? -No, no, no, we've had the vase. My choice this time - we're going for cups. And there they are in your collection. I told you about those cups. shall we find out how much your items were worth? We start with the book. this is a British first edition, not a US first edition. Now, from here, we go to the watch. And you seriously contested that watch. Throughout the programme, "We want the watch, we want the watch." You ended up with it. Was it worth the trouble? are the pride of its maker. And when I say, "They don't make them like that any more,"
in this instance, I really mean it. the cylinder is a natural ruby, hand-worked. The value of this watch - £1,500. They had better...for Bob's sake. could appeal to those who collect children's items. There's a crack to one and some chips to the rims of both. Well, Linda, does the name Clarice Cliff mean anything to you? Well, these are nothing to do with Clarice Cliff. and entertained us a lot this afternoon. Thank you so much for playing For What It's Worth. Well done, Chloe and Phyllis. is for you to claim your prize. and we will give you its value in cash. And the top lot is still in the game. So, which one do you want to choose? but we've said that's Lalique. It's a Lalique. So that's a name, isn't it? -Shall we go for the Lalique? -Shall we go with the name? Yeah. We'll go with the figure. The figure, which you say is Lalique. OK, that's it, that's what you've chosen. But what haven't you won? Well, first, you walked away from the pair of salts. by Adie Brothers Ltd of Birmingham. Sterling silver and are in excellent condition. from the right maker can easily command four-figure sums. So, what were they worth? Well, £80 would have bought them at auction. -So, no great loss there. which you were pretty scathing of initially. Now, here is the Chinese vase which went backwards and forwards. I think it cries out potential, does it not? the table and the figure. The condition's there, you loved it. But then at the 11th hour, you went with the figure. Maybe should have gone with the instinct. So, Phyllis and Chloe, you have won the value of this figure. I wonder if we could tempt you with our Mystery Lot. Come in. Chloe and Phyllis, there is the figure. Paul is going to tempt you with today's Mystery Lot. but what really makes this item special is the engraved inscription. to England from the Crimea after the Russian Revolution. W Marks was a sailor on board the ship. from the imperial Russian royal family. A quality item with a unique provenance. It's a good temptation, isn't it? It is a good temptation. What do you think, Nanna? I don't want to get it wrong again. Go with the Russian family, I'm tempted. We heard earlier that Russian things are sought-after, didn't we? I've got a feeling it could be worth more than this. I'm thinking we go with what Nanna says. I think we should go with the Russian connection. Now we need to know, what have they thrown away here, Paul? A gorgeous piece of dark green topaz glass. see that it's stamped with the name Lalique. a symbol of French style and luxury. designed to sit at the front of your car. let's say, the affordable to hundreds of thousands of pounds. You've just walked away from £400. Right, OK. You've thrown away £400. -Paul, tell us how much this silver cigarette case is. and this one is very, very heavily worn indeed. We didn't look at the hinge, which was badly distorted. I mean, there's used and then there's wrecked. Chloe and Phyllis, today you are going home with £1,650. Paul, thank you so much, it's been lovely to have you here. Thank you for all your expertise. That was amazing. I'm so thrilled for you. 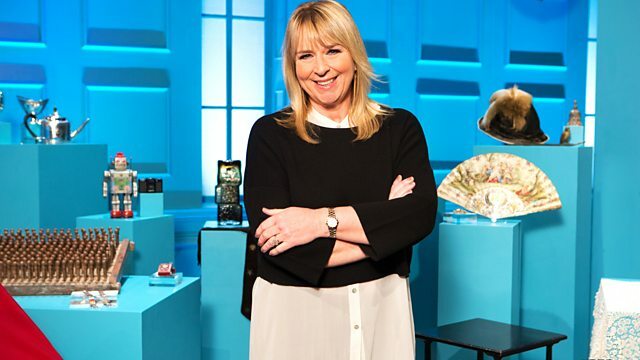 Paul Laidlaw assists Fern Britton, giving his expert insight into the wonderful world of antiques and collectibles as the three pairs of contestants answer general knowledge questions, hoping for the chance to add antiques to their collections and win the game.